Note: This post was originally published on Aug. 6, 2014 and was updated on Oct. 21, 2018 to reflect new features in the Instabug SDK for Android. 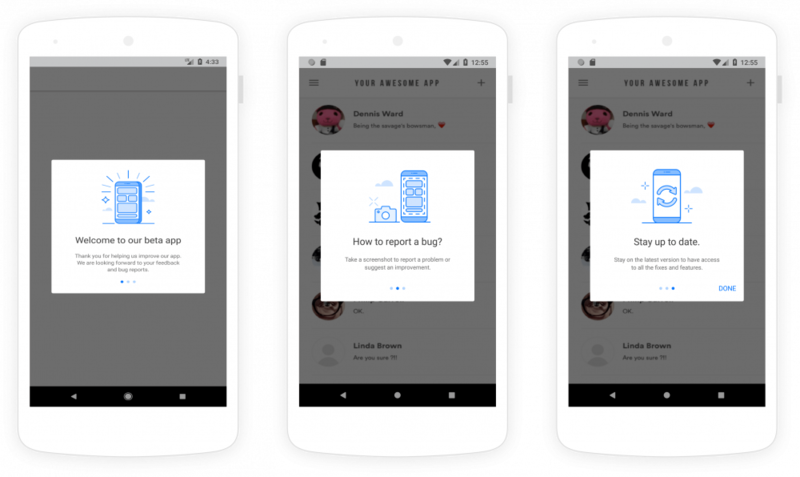 Alright, so hopefully by now, you’ve had a chance to integrate the Instabug SDK for Android into your application and have received your first bug, crash, and feedback report. If you still haven’t, you can read here to learn how. For this post, I want to explain some of the features available with the SDK and how you can really tweak and customize behavior to fit your application. User experience is a very crucial part of your app and here at Instabug, we believe that our SDK should be adaptive to allow for the customization of different elements. By default, Instabug is invoked when the device is shaken. The reason we chose the shake gesture to invoke the feedback process is that it is the behavior that a lot of frustrated users exhibit. We have all shaken our phones at one point due to something not working right. However, we know that sometimes the shake gesture is used in other applications. To customize the invocation events, pass the values of the InstabugInvocationEvent enum when starting the SDK. If you want to invoke the SDK manually or under certain conditions only, you can use the None event to disable the out-of-the-box invocation methods. If you are using the shake gesture, you can set the shaking threshold as described here. If you are using the floating button, you can set its default position as explained here. To change the invocation method, call the following API at runtime. If you want to invoke the Instabug SDK manually, use the invoke method. For more ways to customize the Instabug for Android invocation methods, see our documentation. For white labeling, contact us to learn about our fully customized enterprise plans. You can control which options are displayed by enabling or disabling any of the features separately. 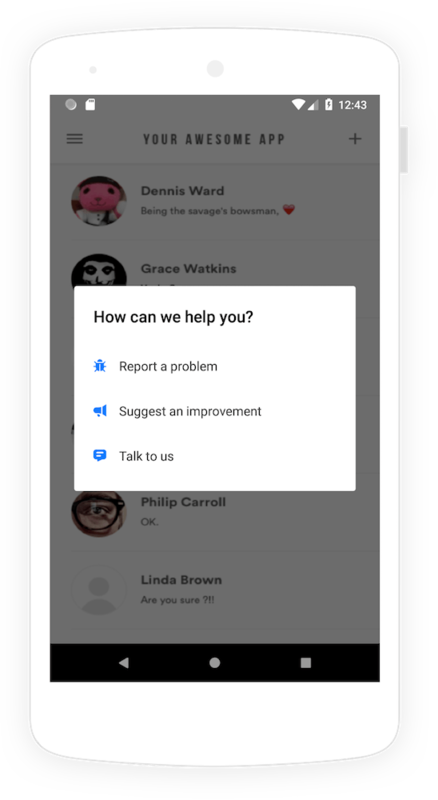 When only a single option is enabled, the prompt options modal does not pop up after invocation and the flow goes immediately to the bug report, feedback, or in-app chat view. If all options are disabled, the bug report becomes the default view. 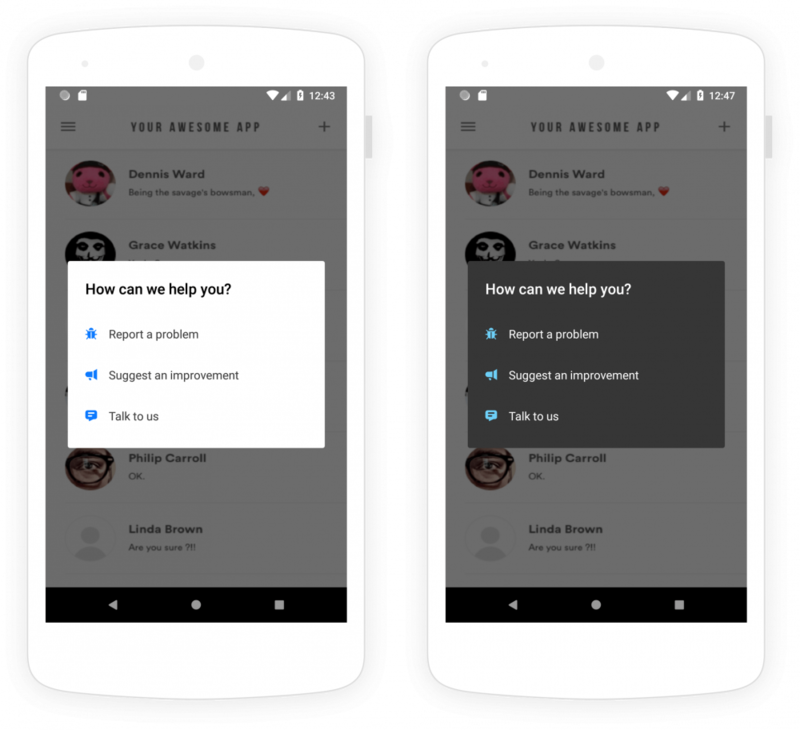 We collect some data to help you identify any user who submits a bug report or sends you feedback, and you can customize this data according to your needs. The Instabug SDK bug report view. By default, a valid email address is required to submit any report. You can also pre-fill the email field with a specific email address. We recommend calling this API as soon as your user logs into your app. 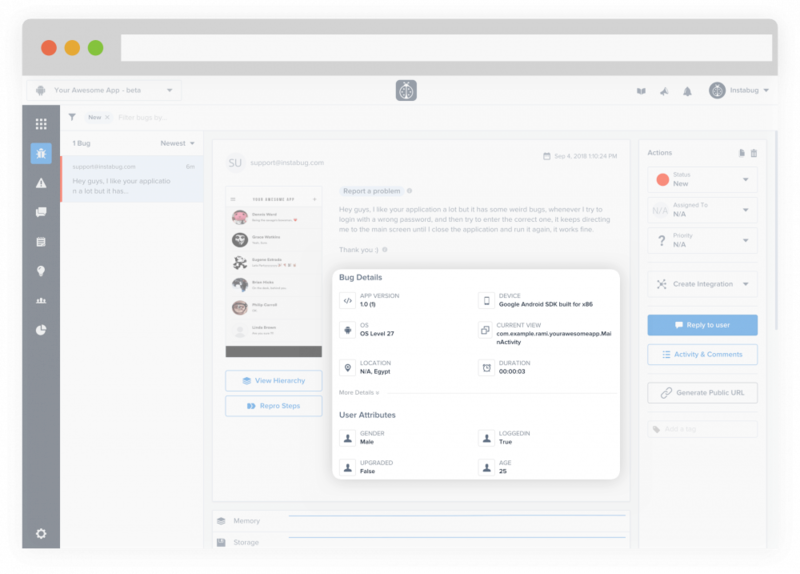 You can also allow your users to send bug reports or feedback without entering an email address. 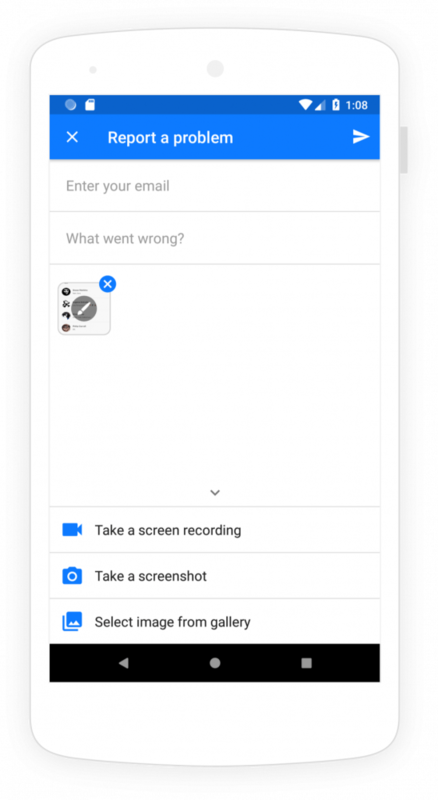 If all the information that we capture about your users and their devices isn’t enough and you’d like to add more information, we have a section in each report for that specific purpose. To collect additional information about your users who submit bugs and feedback, you can assign custom attributes to your users. These attributes appear in your dashboard along with each report and you can use them to filter reports later for easy access and further analysis. To add a new user attribute, call the following method at your initialization step, or perhaps after a user has logged in. For more ways to customize your users’ data, see our Instabug for Android documentation. 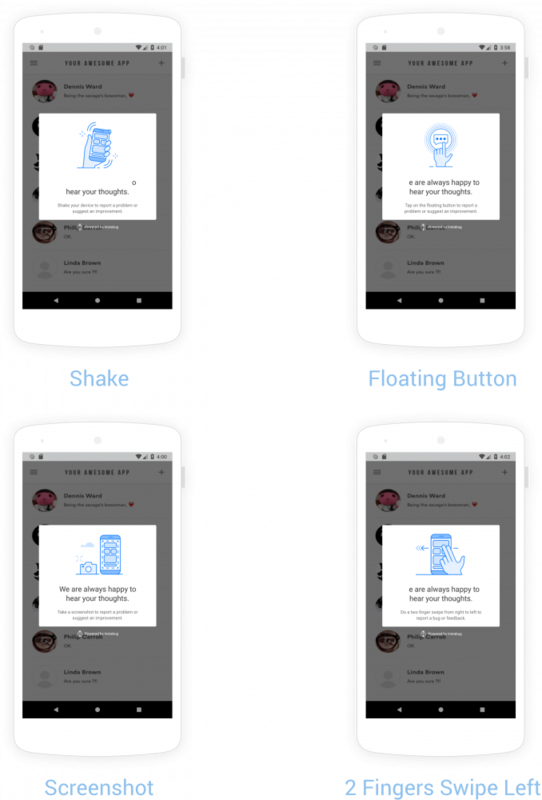 With Instabug for Android, you can customize certain design elements to match your brand and minimize disrupting your users’ experience in your app. Instabug for Android light and dark themes. The Instabug SDK has two color themes: light and dark. You can set which theme to use in your app. You can also set the accent color of the UI elements that indicate interactivity or a call to action to align with your brand’s colors. By default, the SDK will automatically use the current locale of your user’s device. To override it, call the following API. For the full list of possible locales, see our Instabug Android documentation. To customize any of the text content displayed in the SDK, you can override each individual string. For the full list of keys, see our Instabug Android documentation. By default, a welcome message is shown to your users within the first 10 seconds of their first session after you integrate the SDK in your app. The message includes instructions for how to invoke Instabug in order to report a bug or send feedback. For beta apps, a three-step onboarding modal is displayed, as shown below. For production apps, a single welcome message is displayed depending on the invocation method that you set. Out of the box, the welcome message is set by default to live mode. To change or disable the welcome mode, use the following method. For full control, you can display the welcome message manually. Along with Console Logs, Instabug Logs, User Steps, and Network Logs, you can also log custom user events with each bug and crash report. To learn more about customizing logs in the Instabug SDK for Android, see our documentation. 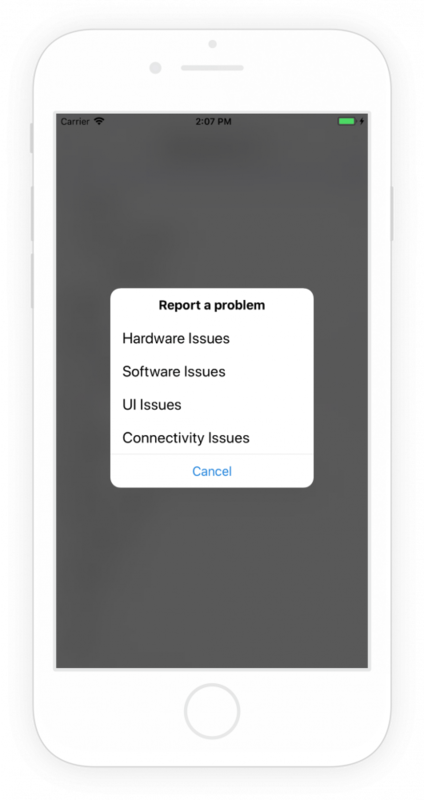 To help you triage bug reports and feedback faster, you can enable custom categories to appear after the prompt options modal. This allows your testers or users to self-select the appropriate category of the bug they are reporting. Instabug custom bug report categories. To customize these settings, simply navigate to your app settings in your Instabug dashboard—no code required. For even more customizations, check out our documentation or contact us at support@instabug.com. We’re happy to help you adapt the Instabug SDK to fit your app and users’ behavior. What other customization options would you like to see? E-mail our team at product@instabug.com with your suggestions and we’ll look into baking them into the Instabug SDK for Android.